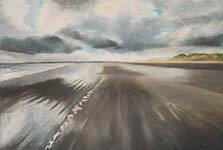 A pastel painting of Druridge Bay. The bay is 7 miles long stretching from Amble in the North to Cresswell in the South. Northumberland Coast Country Park is situated within the bay. Druridge Bay is best known to bird watchers. The original pastel painting is currently available, please contact me.